Edenflo is the lower mainland’s first choice for residential and commercial pump truck services. Businesses choose us because we have an extremely wide range of services available, a large selection of available equipment, and experience serving the needs of our large and diverse corporate clientele. We offer the best service to Food Service and Production clients, including Grease Trap and Grease Interceptor cleaning and maintenance, as well as food and organic waste disposal. We offer commercial sanitary services, including holding tank and treatment plant service and maintenance, cleaning and maintenance to sewer lines and pumping stations, and commercial vacuum services. For those businesses with buildings to maintain, we offer storm drain and catch basin cleaning services, including “lowboy” truck service that’s able to get into underground parking lots and other hard-to-service areas. When a problem occurs, we can positively diagnose blockages and other problems using Video Line Inspection technology, in which a camera is placed at the site of the problem, allowing us to see exactly what’s going on. We also offer hydro excavation services, which appeal to a large number of clients in diverse industries. 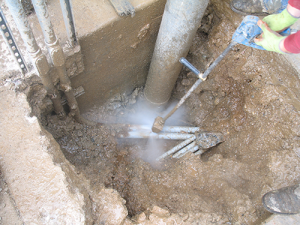 Hydro excavation is removal of dirt and other material by “digging” with a high-pressure water jet, and removal of the dislodged material with our vacuum truck. This allows us to unearth utility lines, underground pipes, and other services without disturbing them. Whether you have a need for vacuum pump service in Vancouver, Aldergrove, Surrey, Langley, Buranby, New Westminster, Delta or White rock, forego the backhoe and go with Hydro Excavation. Contact Edenflo Pump Truck Services at 604-575-1414 and find out what the best vacuum pump option is to get it done, quickly and efficiently. This entry was posted in Edenflo Pump Truck Services and tagged Abbotsford catch basin cleaning, Abbotsford Hydro Excavation, Aldergrove catch basin cleaning, Aldergrove hydro excavation, aldergrove video line inspection services, bc lower mainland pump truck services, bc lower mainland video line inspection, BC Septic system service, BC Septic Tank service, BC sump pump maintenance, bc video line inspection, best vacuum trucks lower mainland, burnaby catch basin cleaning, burnaby video line inspection services, Catch Basin Cleaning and Maintenance, catch basin cleaning BC, Catch basin cleaning Delta, catch basin cleaning New Westminster, Catch Basin cleaning Richmond, Catch Basin Cleaning Vancouver, Delta hydro excavation, delta video line inspection, grease interceptor cleaning Vancouver, grease trap inspection, grease trap maintenance, Grease trap service, grease trap service Vancouver, grease traps clogging, hydroflushing white rock Hydro jetting, Langley hydro excavation, langley video line inspection services, new westminister video line inspection services, north vancouver video line inspection services, Storm drain cleaning, storm drain cleaning lower mainland, storm drain maintenance surrey, Surrey hydro excavation, surrey video line inspection services, underground parking drain cleaning, white rock hydro excavation on July 24, 2018 by Edenflo.